Canwood Lakecrest Desk - Natural by Canwood at Indsight. MPN: 2610-5. Hurry! Limited time offer. Offer valid only while supplies last. Give your child the ideal work space with the Canwood Lake crest Desk, as it features a large table top and three, different-sized spacious drawers. 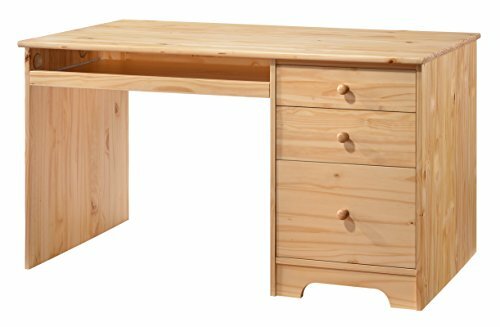 Give your child the ideal work space with the Canwood Lake crest Desk, as it features a large table top and three, different-sized spacious drawers. Inspired by the natural beauty of the Pacific Northwest and with the unique ability to fit underneath the Canwood Lake crest Loft Bed, the Canwood Lake crest Desk is the desired space to study or read. The desk also features a slide-out tray, allowing you the option to install a computer keyboard. Made with beautiful solid pine wood, wood composites and steel hardware, the Canwood Lake crest Desk is durable, fashionable and essential to your child's education needs. Keep this desk even more organized with the addition of the matching Canwood Lake crest Hutch.